In partnership with the ECAC Hockey league, Headway held a successful Concussion Awareness Weekend during the February 3rd and 4th league games. The weekend was dedicated to promoting a safer sports culture surrounding concussions and supporting teammates during recovery. 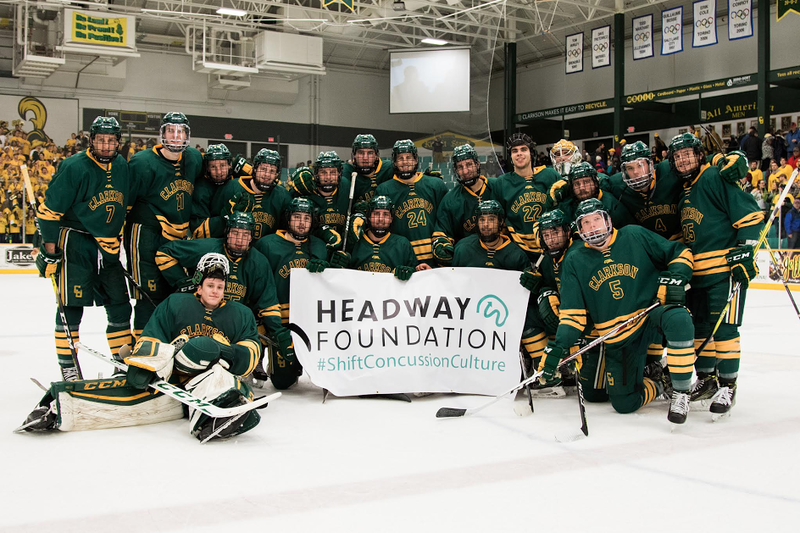 All twenty-four ECAC hockey teams participated in a variety of initiatives to raise awareness and funds on behalf of the Headway Foundation. Over 600 student athletes wore the signature Headway sticker on their hockey helmets as a reminder of their commitment to handle concussions properly. Teams also participated in a variety of social media outreach efforts to spread awareness for Headway's message. The CDC estimates that 69% of student athletes neglect to report possible concussion symptoms, and social media efforts were geared towards challenging this stigma. The teams took photos holding a Headway banner with the hashtag #ShiftConcussionCulture. Fifteen teams also made videos to further promote this message. Alongside these videos, Headway Foundation released a four minute short film about a young athletes recovery from a concussion. The film, titled "NEW TOUGH", challenges the stigma behind concussion reporting and recovery by redefining and broadening an athlete's definition of toughness. NEW TOUGH shows that the tougher but neccesary thing to do is to remove yourself from play and take the right steps to heal when a concussion occurs. The film was promoted over the weekend and played on a jumbotron in between periods at both the Harvard Men's and Women's hockey games and the Quinnipiac Women's hockey game. As part of a league-wide fundraising effort, teams also competed in a Goals Challenge. Fans were able to pledge a donation per goal scored by the ECAC hockey team of their choice. Altogether a league wide total of $6540.50 was pledged on behalf of the Headway Foundation. Our top six performers were Harvard, St. Lawrence, Yale, Princeton, Brown and Union. Coming in first place with the highest pledge total was Harvard University at $1,368. The men's and women's hockey teams scored a combined total of eight goals and fans pledged a total of $171 per goal. St. Lawrence University trailed closely behind with the second highest pledge total at $1,172.50. The Saints brought in the highest pledge per goal tally at $234.50. Five combined goals over the weekend earned them the second spot in the Goals Challenge. Yale University finished comfortably in third place with $1,116 pledged. The Bulldogs scored eight goals and fans pledged $132 per goal scored. Thank you to the ECAC hockey league and all the teams and fans who participated this past weekend!